^ a b J. Jouzel, V. Masson-Delmotte, O. Cattani, G. Dreyfus, S. Falourd, G. Hoffmann, B. Minster, J. Nouet, J. M. Barnola, J. Chappellaz, H. Fischer, J. C. Gallet, S. Johnsen, M. Leuenberger, L. Loulergue, D. Luethi, H. Oerter, F. Parrenin, G. Raisbeck, D. Raynaud, A. Schilt, J. Schwander, E. Selmo, R. Souchez, R. Spahni, B. Stauffer, J. P. Steffensen, B. Stenni, T. F. Stocker, J. L. Tison, M. Werner and E. W. Wolff,Orbital and Millennial Antarctic Climate Variability over the Past 800,000 Years, Science 10 August 2007, Vol. 317 no. 5839 pp. 793-796. ^ a b Michael E. Mann, Zhihua Zhang, Malcolm K. Hughes, Raymond S. Bradley, Sonya K. Miller, Scott Rutherford and Fenbiao Ni, Proxy-based reconstructions of hemispheric and global surface temperature variations over the past two millennia, Proceedings of the National Academy of Science(PNAS), September 2, 2008, vol. 105, no. 36, 13252-13257. ^ Brohan et al. (2006) 'Uncertainty estimates in regional and global observed temperature changes: A new dataset from 1850.' JGR. ^ Smith and Reynolds (2005) 'A global merged land and sea surface temperature reconstruction based on historical observations(1880–1997). Jour. Climate. 18:2021–2036. ^ Hansen et al. (2001) 'A closer look at United States and global surface temperature change.' JGR 106:23947–23963. ^ Rasool, S.I. ; Schneider, S.H. (1971). “Atmospheric Carbon Dioxide and Aerosols: Effects of Large Increases on Global Climate”. Science 173 (3992): 138–41. Bibcode: 1971Sci...173..138R. doi:10.1126/science.173.3992.138. PMID 17739641. ^ Hays, J.D. ; Imbrie, J.; Shackleton, N.J. (1976). “Variations in the Earth's Orbit: Pacemaker of the Ice Ages”. Science 194 (4270): 1121–32. Bibcode: 1976Sci...194.1121H. doi:10.1126/science.194.4270.1121. PMID 17790893. ^ Peterson, Thomas & Connolley, William & Fleck, John (September 2008). “The Myth of the 1970s Global Cooling Scientific Consensus”. Bulletin of the American Meteorological Society (American Meteorological Society) 89 (9): 1325–1337. Bibcode: 2008BAMS...89.1325P. doi:10.1175/2008BAMS2370.1. オリジナルの2012年1月14日時点によるアーカイブ。. https://web.archive.org/web/20120114082810/http://scienceblogs.com/stoat/Myth-1970-Global-Cooling-BAMS-2008.pdf. ^ Paul R. Ehrlich(1968)"The Population Bomb"
^ Emiliani, Cesare (November 1972). “Quaternary hypsithermals”. Quaternary Research 2 (3): 270–3. Bibcode: 1972QuRes...2..270E. doi:10.1016/0033-5894(72)90047-6. ^ Kukla GJ, Matthews RK, Mitchell JM (November 1972). “Guest editorial: The end of the present interglacial”. Quaternary Research 2 (3): 261–9. Bibcode: 1972QuRes...2..261.. doi:10.1016/0033-5894(72)90046-4. [Was an imminent Ice Age predicted in the '70s? No Lay summary]. ^ Kukla, G.J. ; Matthews, R.K. (1972). “When Will the Present Interglacial End?”. Science 178 (4057): 190–202. Bibcode: 1972Sci...178..190K. doi:10.1126/science.178.4057.190. PMID 17789488. ^ SCEP. “The 1970 SCEP report”. Was an imminent Ice Age predicted in the '70s? No. 2005年11月17日閲覧。 英題："Study of Critical Environmental Problems"
^ Cosmos: A Personal Voyage, Episode 4, Scene 9 "Change"
^ Schneider, Stephen (29 December 1977). “Against instant books”. Nature 270 (22): 650. http://stephenschneider.stanford.edu/Publications/PDF_Papers/Schneider1977.pdf. ^ EPICA community members (10 June 2004). 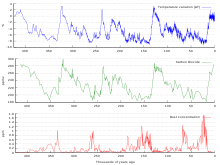 “Eight glacial cycles from an Antarctic ice core”. Nature 429: 623–628. doi:10.1038/nature02599. http://www.nature.com/nature/journal/v429/n6992/abs/nature02599.html. ^ Berger, A.; Loutre, M. F. (2002). “An Exceptionally Long Interglacial Ahead?”. Science 297 (5585): 1287–8. doi:10.1126/science.1076120. PMID 12193773. EPICA community members (10 June 2004). “Eight glacial cycles from an Antarctic ice core”. Nature 429: 623–628. doi:10.1038/nature02599. http://www.nature.com/cgi-taf/DynaPage.taf?file=/nature/journal/v429/n6992/abs/nature02599_fs.html. Schneider, Stephen (29 December 1977). “Against instant books”. Nature 270 (22): 650. http://stephenschneider.stanford.edu/Publications/PDF_Papers/Schneider1977.pdf.